Alexander McQueen's runway presence is typically far from ordinary, and nothing screams "McQueen!" more than the infamous armadillo shoes. And though no one besides Lady Gaga seems to be a fan of actually wearing them, now's your chance to own a pair of the ankle-snapping shoes for a good cause. That's right, McQueen's armadillo shoes will be auctioned off to raise money for UNICEF's Nepal relief fund. According to a report from Harper's Bazaar, three pairs of the iconic footwear will be created for the auction, which is the first time the shoes have been made since their appearance on McQueen's Spring/Summer 2010 runway. This being Lee McQueen's last runway before his death, the 21 remaining shoes have been displayed in countless museums, which is only fitting — these shoes are that awe-inspiring. The bidding, which is held online by Christie's begins Tuesday and will last eight days, so if you have a spare $10,000 or even more, feel free to place your bid on a pair. Let's face it — the price tag is way above the practical person's budget, but at least all the proceeds are going to a good cause. While you may have to admire the shoes from afar, someone's going to be spending major bucks on these shoes and benefitting the relief effort in Nepal at the same time. 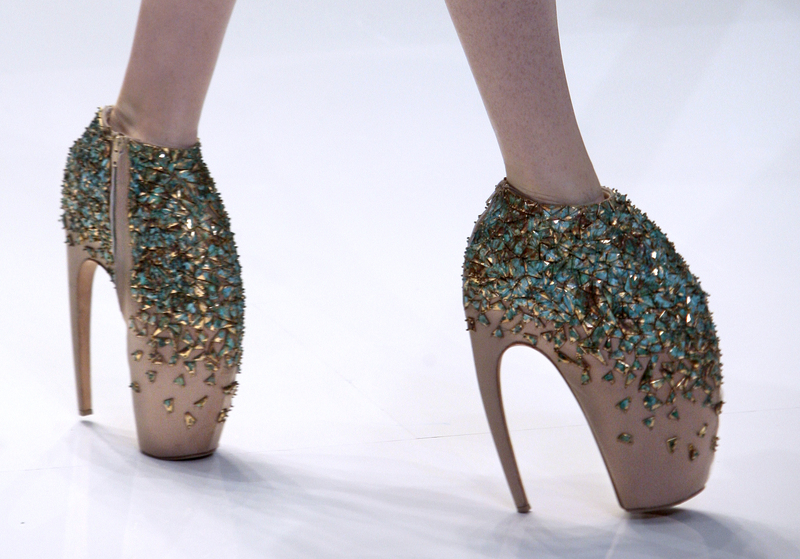 Of course, McQueen isn't the only label to put out crazy shoes on the catwalk. Take a look at these ankle-breaking stilettos that will probably never grace your closet. These shoes took the floral theme literally, combining a lucite platform heel with blooming roses. They're basically like prom corsages for your feet. These fang-like ankle boots may be a bit too spooky for everyday use, but could totally be used as a weapon (for self defense only, of course). Cousin It meets.... Cousin It. These just look oh-so uncomfortable.